This is so that the user is not overwhelmed by all the information and can read the messages easily. When building a bot in Tars, you want to optimize the UX so that users can easily understand what is going on in the bot. Part of this means that the user should have enough time to read each message before the bot sends the next message. This is why we have included the message delay feature. Next to the message text you will notice a smaller green bubble with 1.0 written in it. This represents the number of seconds of delay before the message it is next to. That is, if you change it to 2.5, the bot will wait 2.5 seconds before sending the message. We recommend that you set higher delays when the previous message is longer. Take the example below. 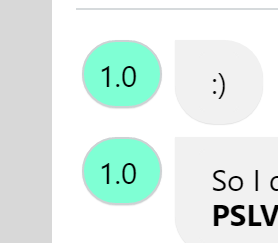 We added a delay of 3 seconds before the message saying PSLV stands for Polar Satellite launch Vehicle because the previous message was slightly longer and the user might require more time to read it.